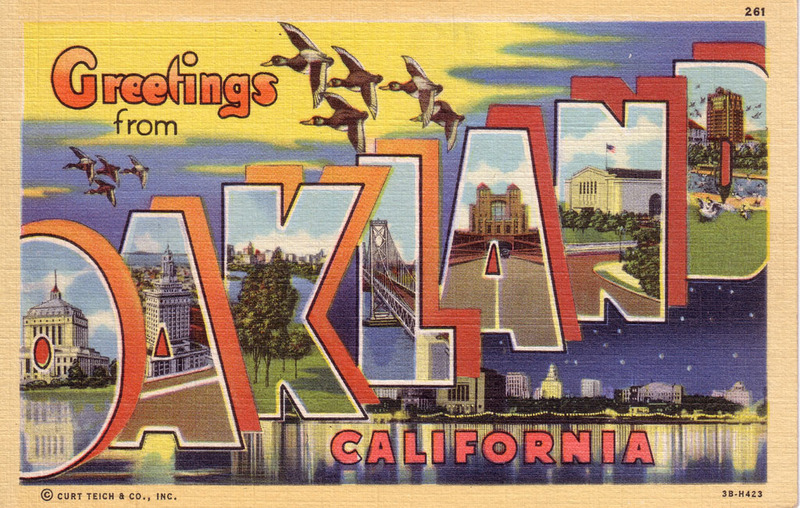 In honor of Oakland's 160th Birthday, all this week I'll be running articles about Oakland history. For more about some of the events going on, check out my article on Oakland Local. See past posts about Oakland history here. 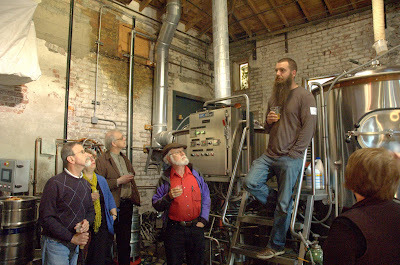 Earlier this month, members of the Oakland Heritage Alliance learned about beer at an event called On Tap: Oakland's Beer Brewing History. 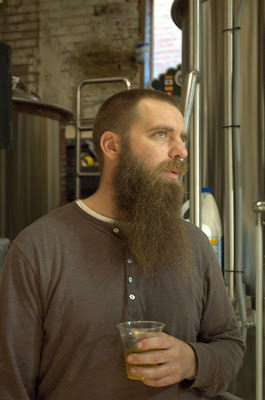 Adam Lamoreaux, founder of Linden Street Brewery, showed us around the brew house and gave us a brief history of beer in the Bay Area. Beer itself is fairly simple, with water, barley, hops and yeast combined in different ways to make a wide range of styles and flavors. Yeast is what makes the magic happen, converting grain sugars into alcohol and CO2. The type of yeast dictates the type of beer; lager yeast ferments at cooler temperatures near the bottom of the fermenter, while ale yeast ferments at a higher temperature at the top. The cooler temperatures for lager yeast could easily be found in caves and cellars in Europe much of the year, but in the mid-1800s, immigrants to the Bay Area found things a bit too warm. So they adapted by creating steam beer. Steam beer uses a lager yeast, but at the warmer ambient temperatures of the Bay Area. That plus the choice of available barley and hops makes for a uniquely flavored beer style, probably best known today because of Anchor Steam. The yeast was influenced by the wild yeasts in the Bay Area, which are part of what makes sourdough bread around here unique. 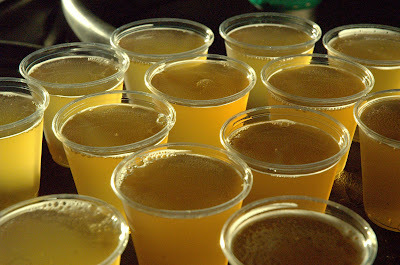 A small amount of active yeast was added for the beer to finish in the cask, which gave it a higher level of carbonation. That is likely the source of the name, as tapping the high-pressured kegs would sometimes blow off "steam" (CO2). Apparently sloppy stocking practices by some publicans and variations in production even lead to the occasional burst keg. In any event, the term "steam beer" is now a registered trademark of Anchor Brewing. That might rankle some people if were any other company; Fritz Maytag who bought and saved Anchor in 1965 is considered the father of the modern craft beer movement. 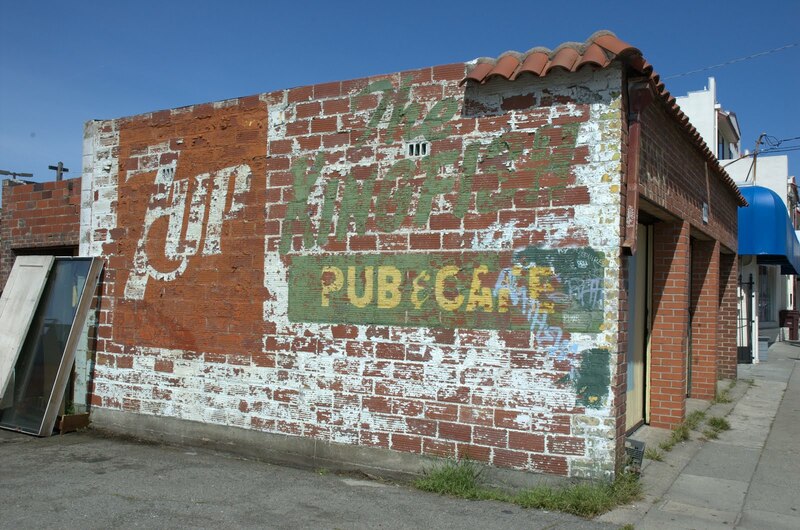 By 1890, there were four breweries flourishing in the city of Oakland. 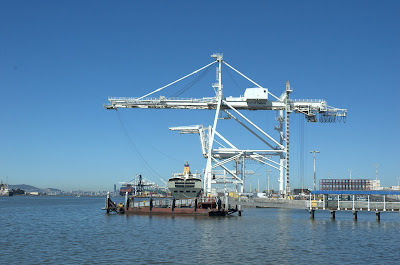 At a time when Oakland's population was 48,682, breweries in Oakland alone turned out 35,000 barrels of beer annually. [It] was a local product. 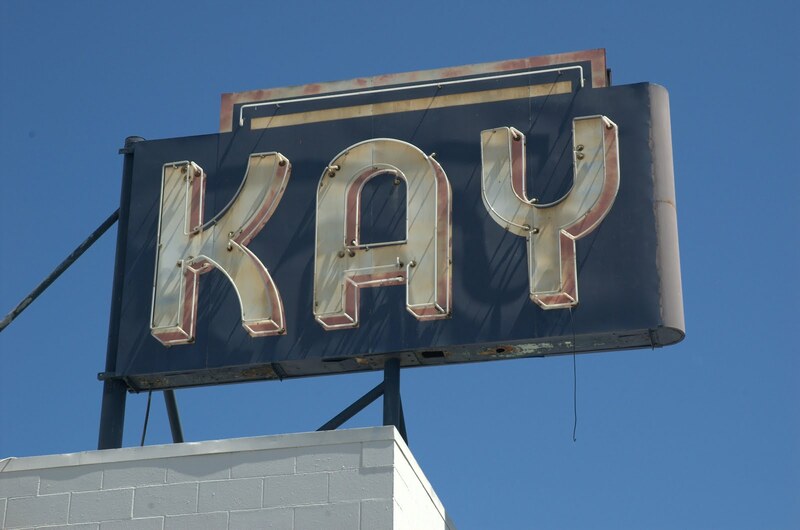 Even after Brooklyn became part of Oakland, people liked to use the name to distinguish their neighborhood. The Brooklyn Brewery began 1872 under A. Miller at Eighteenth Avenue and East Fourteenth Street. At its peak during summer months, Brooklyn produced 35 barrels of Brooklyn Steam Beer a day. That's over a 1,000 gallons a day. One of the longest lasting breweries was the Golden West Brewery (ever noticed the sign at Heinhold's? ), later Goebel Brewing Company, which sponsored radio broadcasts of the Oakland Oaks baseball team. This history of beer in Oakland is part of what inspired Adam when he started Linden Street Brewery a few years ago. 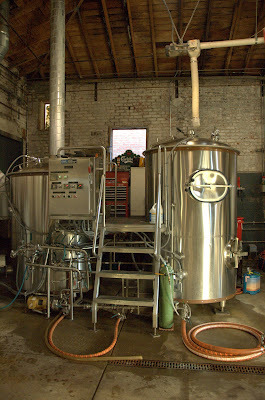 While brew pubs (like Pacific Coast Brewing) have been part of Oakland for a while, Linden Street Brewery was the first production brewery* in Oakland since 1959 (*production brewery = makes beer for consumption at restaurants and bars, not on the premises, though Linden Street now has a tap room.) Linden Street has been growing at a healthy pace, and now is an incubator for other beer entrepreneurs like Dying Vines Brewing. Future plans include using a unique strain of hops grown in by farmers in Hopland, California, which bottomed out at the same time smaller brewers around the U.S. did in 1959. Linden Street already makes a beer in partnership with Tartine Bakery using the yeast from one of their breads, and recently released "Supafly" rice lager, a custom brew for Hawker Fare. Hopefully there will be more such custom brews featuring local ingredients in the future. It's always fun to find a sign I haven't seen before. Kay (Chesterfield) is just north of the Coliseum. 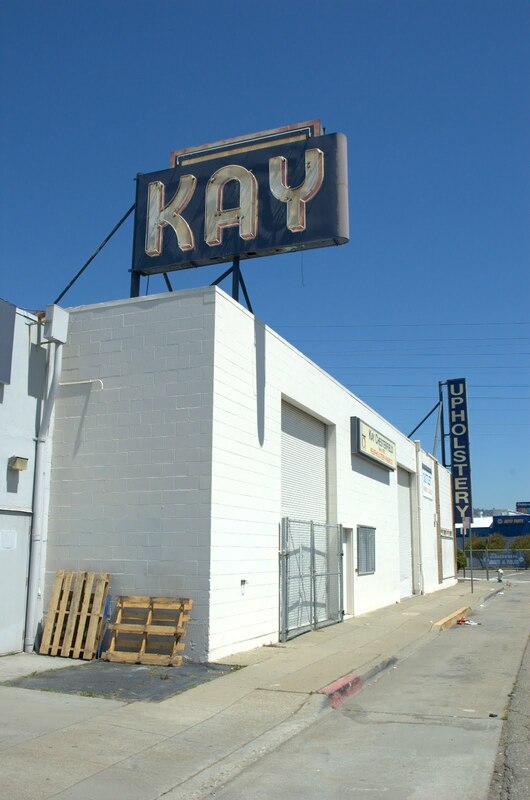 I don't know how old the sign is, but it looks fairly old and Kay Chesterfield upholstering has been in business since 1921. Quick quiz: how many of you know what a chesterfield is? OMCA: Summer Nights - Friday, April 27, 5-9pm. Half-price admission to the Oakland Museum, plus special movie screenings. More info. California Preservation Conference - May 3-6. The California Preservation Foundation's annual conference is being held in Oakland this year. 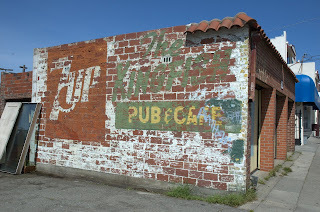 There are tons of related tours and events of interest to historians and Oaklanders alike. Five Star Night - Meals on Wheels Benefit - Friday, April, 27. Benefit dinner for Alameda County Meals on Wheels. Featuring chefs from Bakesale Betty, Dopo, Ozumo, Bocanova and more. Read more at Oakland Local. JLS Night Market - Friday, May 4 from 6-10pm. During the First Friday Art Murmur, the Farmers Market at Jack London Square will be holding a night-time farmers market. Friends of Montclair Library Book Sale - Saturday, May 5, 10:30am-3pm. Homeroom takes mac and cheese to a new level. This isn't made from a box with powdered cheese. 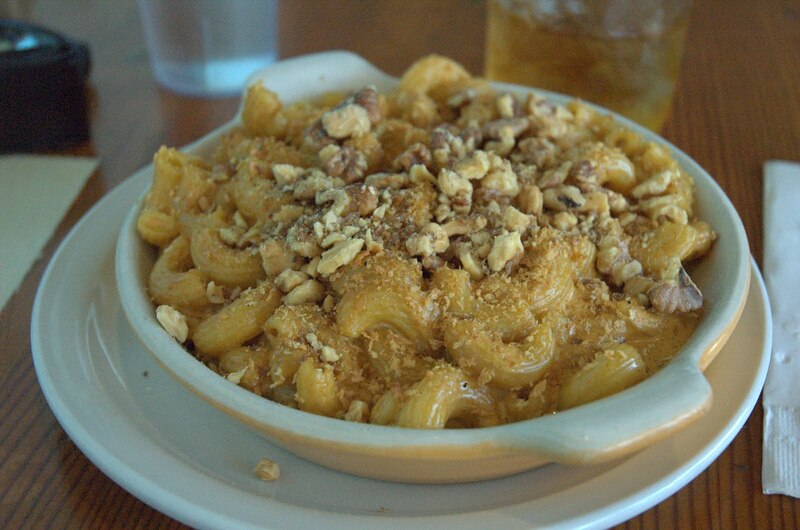 It's homemade with local artisanal cheeses to create dishes like Mac the Goat featuring chevre, and Mac and Blue featuring Point Reyes Original Blue™ cheese. All macaroni dishes (except the Vegan) can be ordered gluten-free, and can be customized with toppings like panko breadcrumbs, mushrooms or a fried egg. Homeroom also has a variety of vegetable side dishes, and a customizable salad. 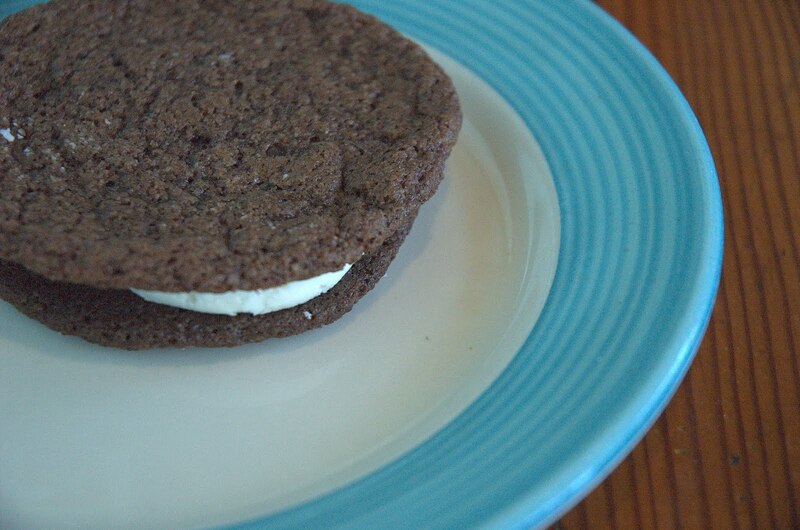 During lunch hours, there are some sandwich options, too: the old school peanut butter + jelly, grilled cheese, or a BLT. When I was there, the restaurant also offered soup, though I don't see it on the regular menu. If you manage to save room for dessert, there are enormous homemade Oreo-style cookies topped with sea salt, peanut butter pie with a graham cracker crust, and delicious homemade brownies. Adults can indulge in a beer float made with Old Rasputin stout. 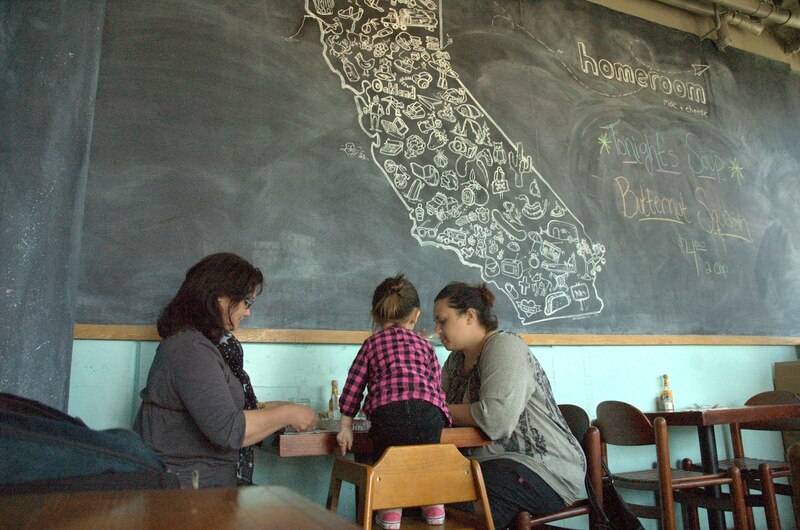 On weekends, come for brunch, where you can enjoy homemade buttermilk biscuits with INNA Jam from Berkeley, a runny-egg sandwich, or a breakfast mac. The drinks menu adds mimosas made with fresh orange juice. 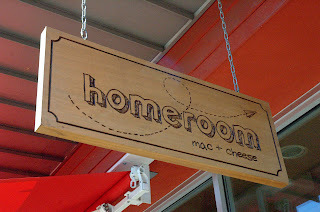 Homeroom serves homemade root beer, organic limeade, ice tea, and Blue Bottle coffee. 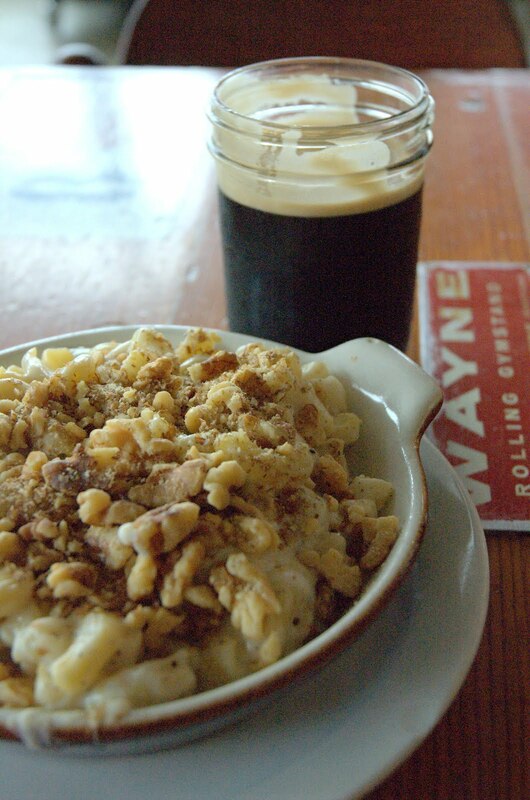 It also has a good beer list, featuring local beers from Oakland Brewing Company, Drake's Brewing, and more. The wine list is diverse, with a variety of California reds and whites, and even a rosé. I've been to Homeroom twice for lunch, and it's been busy both times, even for a late lunch. Despite the busyness, the host greets visitors promptly, and the table service has been excellent. On my first visit, one of the restaurant co-owners stepped out of the kitchen to see how my meal was. As its name suggests, Homeroom is kid-friendly, comfortable, and has a few booths as well as tables. With tables made from old gymnasium bleachers and a wall featuring a large chalkboard with art, you’ll feel like you're back in school. 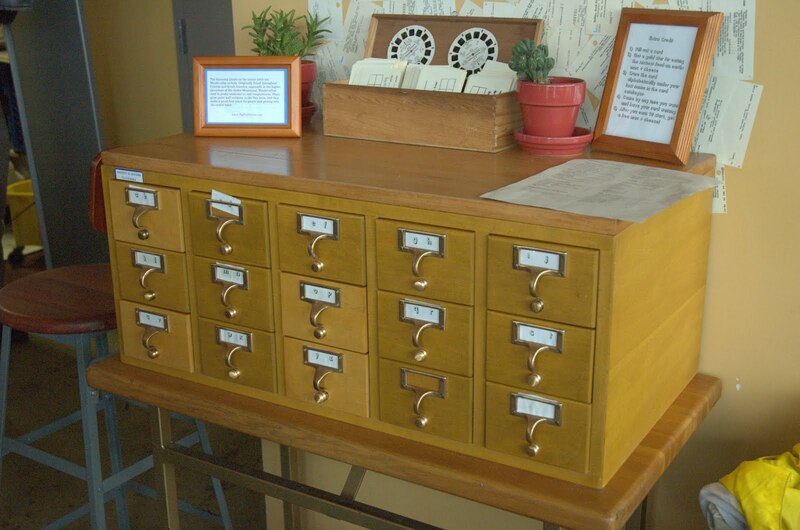 The "frequent diners" cards for regular customers are even old library cards stored in an old wooden card file. I half expected the classroom clock on the wall to ring when it was time to go. May 4th, 2012 will mark 160 years since Oakland was incorporated as a city. To celebrate its birthday, the city will be hosting a number of events in and near city hall. Celebrate Oakland Parks and Rec's 2012 summer program. Celebrating the artistry of Oakland, with special performance by the Oakland School for the Arts. Celebrate Oakland's history before and after its incorporation in 1852. This will include a panel of local authors about Oakland history, including Annalee Allen, author of Selections from the Oakland Tribune Archives, Oakland - postcard series, and the beautifully illustrated Oakland Landmarks book. A celebration of Oakland as the regional center of ethnic and urban dance. Includes live performances by various local dance troupes. Celebrating Oakland's musical heritage and emerging talent in a tribute to the late jazz great Khalil Shaheed. Lots of fun things, including a birthday cake cutting, history displays, live music, city hall tours, and a presentation of the winners of the "Inspire Oakland" billboard design contest. The celebration is a nice lead in to the California Preservation Foundation (CPF) annual conference which is being held in Oakland this year, May 3-6. It's the 37th annual CPF conference, and the first time in 30 years that the conference is being held here. There are numerous tours and workshops being put on as part of the CPF conference, but you don't need to attend to the whole conference to take part in them. A few of the tours are listed below. Visit Rosie the Riveter / WWII Home Front National Historical Park in Richmond where historic structures and interpretive artworks are employed by the City of Richmond and the National Park Service to tell the diverse social history of WWII. Participants will learn how reviving a neglected chapter in Richmond’s history has deepened understanding of local heritage, shed light on current issues and contributed to community and economic revitalization efforts. Come see the award winning Ford Assembly Building and the SS Red Oak Victory ship, recipient of a Save America’s Treasure grant, and many other treasures. Explore how the largest regional park district in the nation, East Bay Regional Park District, connects historic structures with surrounding landscapes for 21st century visitors. 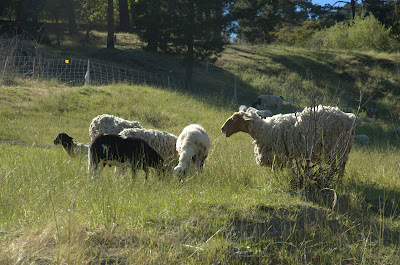 Visit Garin Barn with operational blacksmith and tool shop, ranching-related displays, and antique farm machinery. Next visit the oldest working reservoir in the nation where a one-mile interpretive trail with historic structures and images bring to life the 1860’s construction of Lake Chabot. Visit Peralta Hacienda Historical Park, the first non-Native American settlement of the East Bay in the middle of modern day Oakland. Once the headquarters of a 44,000-acre longhorn cattle ranch, then absorbed into the urban grid of Oakland, and now resurrected by neighbors into a world class historic site and community center. Then take a tour of Redwood Regional Park, a redwood grove in the city of Oakland, once owned by the Peraltas, led by Historian Richard Schwartz with a fascinating preservation history. The redwood grove was razed to the ground twice before preservationists fought to preserve the grove for public use in the early 20th century. Prices vary, but for all the above tours, transportation is included. To register for those or for any other tours, check out this order form (PDF) for more info and contact details. Space is limited, so act quickly if you're interested. Last Saturday 50 people joined Oakland Urban Paths for a walk, Laurel to the Redwoods. The large turnout was due in part to people coming to hear our guide for the walk, Dennis Evanosky, a local historian and writer who is extremely knowledgeable about Oakland and East Bay history. We started the walk at Saint Lawrence O'Toole Catholic Church in the Laurel. The church was originally closer to where I-580 is now, but before the freeway came through, the church moved up the hill to its current location. Then we walked a short distance to Scheberies Used Cars for the first of our urban paths. While Dennis told us about MacArthur Boulevard and the freeway, Gerry Scheberies came over to the edge of the lot. He's been part of Oakland for a long time—since before the I-580 freeway was built. MacArthur Blvd. was part of a national plan for a road, intended to go from Mexico to Canada, but only the Oakland segment was built. See pictures and info from my visit 1.5 years ago. We took a number of urban paths and more traditional sidewalks through the Upper Laurel neighborhood into Redwood Heights, both of which are full of lovely homes. 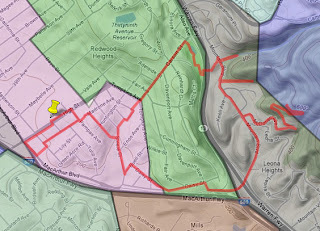 Then it was a big uphill on Carson Street to George E. McCrea Memorial Park, home to the Oakland Casting Club. That's right, Oakland has casting ponds for people to practice their fly casting. The park also has trout ponds, but those are no longer used. Then it was over highway 13 to Leona Heights, once site of the Laundry Farm Hotel. Named for the laundry operations that once filled the area, someone doubtless recognized that a name like Leona Heights Hotel would have more appeal, and the hotel was renamed. The original plan for the OUP hike was to go up the York Trail near Horseshoe Creek, but the heavy rains we got a while back had damaged the trail and bridges, so we just viewed the area from trailhead and heard about the redwoods. Nearby we saw part of a quarry operation. What's left is an odd concrete tube, which rock was pushed down (later they used railed carts) and delivered to a crusher. That rock was used for railroads, including the Feather River Canyon. Up another nearby canyon took us to an abandoned sulfur mine. The original miners were excited because they thought they'd found gold, but it turned out to be iron pyrite (fool's gold). But they soon discovered that the sulfur deposits there could be profitably mined instead. We went up the nearby fire trail a ways, where we could see the old Chabot Observatory below. That was actually the second Chabot Observatory; the original was on 11th and Jefferson in Old Oakland and dated back to 1883. They moved to the Mountain Boulevard location in 1915 because of light pollution, but access to that became limited in 1977 because of seismic safety concerns. The current facility, the Chabot Space and Science Center along Skyline, opened in 2000. Further up the trail we saw the approximate location where one of the first maps of the Bay Area was drawn. We walked back through the triangle between highway 13 and I-580, and saw Montgomery House, a home which was built by the Montgomery family for missionaries to stay in while they prepared to ship out on their mission trips. There's a small chapel on the grounds which is still in use, and we were told the house across the street was one of the earliest orphanages in Oakland. We worked our way back to our starting point, and I at least was definitely tired—as advertised, this was a strenuous walk. Thanks to Dennis Evanosky and Paul Rosenbloom for leading us on the walk, and thanks to all who joined us. The OUP walk coming up in May will definitely be less strenuous. See our route on Google Maps. update: Check out the post by Nika about the walk. Ifeel like I'm about half a dozen posts behind in ideas vs. actual posts. There's way too much interesting stuff going on in Oakland, and I don't have enough time to do half of it never mind write about it. Some of the things in my queue: last weekend's Oakland Urban Paths walk, the upcoming California Preservation Foundation conference in Oakland, Bike to Work Day, a review of the brand-spanking new Banana Soy restaurant on 15th St., a writeup of the Oakland Heritage Alliance "On Tap" event last night at Linden Street Brewery, and probably a few other things I'm forgetting. 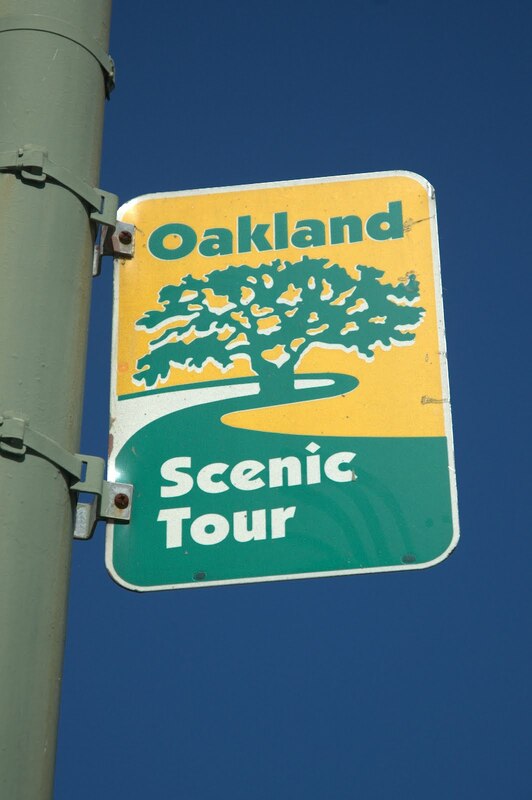 Wait, did I mention the story about the Oakland Scenic Tour signs and map I'm working on? Or the review of Homeroom and some other things I was hoping to spin into a paid writing gig? 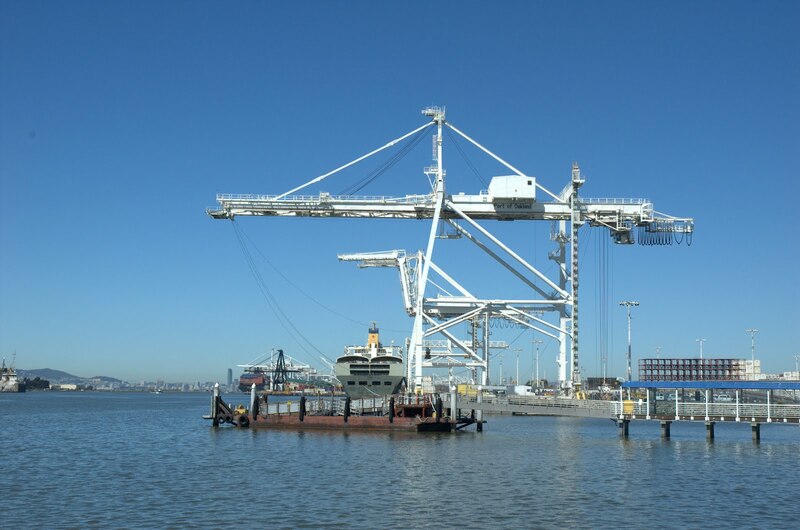 All that beeping around Jack London Square in the middle of the day? That'd be due to whatever it was they were doing to the nearest of the big cranes. If you look closely at the picture, the cables that are normally just below the horizontal arm are hanging slack. There was a lot of activity going up and down the elevator to the operator level, but no one seemed panicked, so no major problems, right? As mentioned above, I discovered a new vegan restaurant downtown, Banana Soy. So new they don't have their desserts ready yet, or their credit card machine operating—they opened yesterday. What I had, I really liked; I'll have a more complete review as soon as I can. In other restaurant news, I went past Kitchen 388 and noted that it's closed until further notice because of family illness. I hope they're able to reopen. On my one visit, I really liked it. OFD showed up quickly because there's a station nearby, and the driver was OK.
Idiscovered this sign hiding behind a tree at the Civic Center Lodge on 6th Street near Laney College. As usual, lots of interesting stuff going on in Oakland this week. The big event this weekend is the annual Earth Day celebration, with cleanups and celebrations all over Oakland. Let me know of other interesting events in the comments. 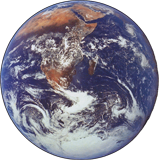 Earth Day - Saturday, April 21. There are dozens of Earth Day events around Oakland, from a cleanup of Willow Park in West Oakland to a neighborhood cleanup in East Oakland with the East Oakland Boxing Association, and numerous park, neighborhood and creek cleanups in between. 4th Annual 24 Hour Film Challenge - April 21-22. The East Bay Express' annual 24 hour film challenge. Teams pick up the topic, then have 24 hours to shoot, edit and produce the film. Sponsored by Actual Cafe, Trumer Pils, and the Oakland Underground Film Festival. Bueno Eats Pop-Up - Sunday, April 22, 9:30am-2:30pm. Bueno Eats is doing a brunch pop-up at one of my favorite places, Caffe 817 in Old Oakland. California Preservation Conference - May 3-6. The California Preservation Foundation's annual conference is being held in Oakland this year. 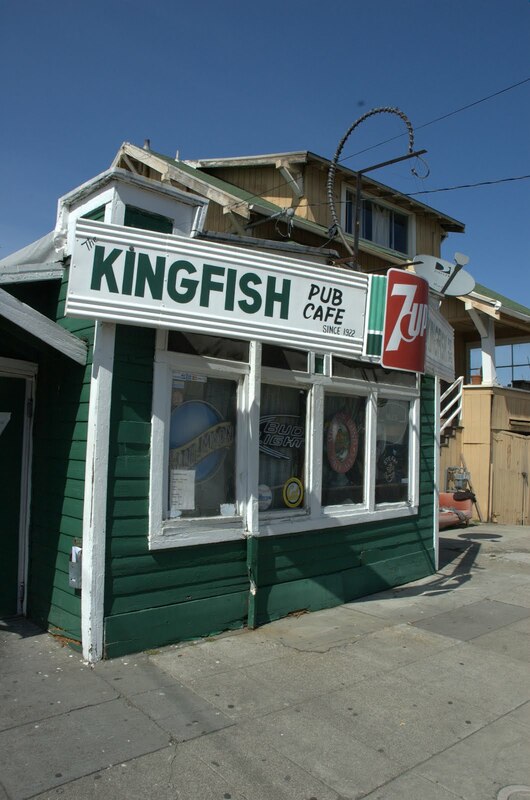 There are ton of related tours and events of interest to historians and Oaklanders alike. 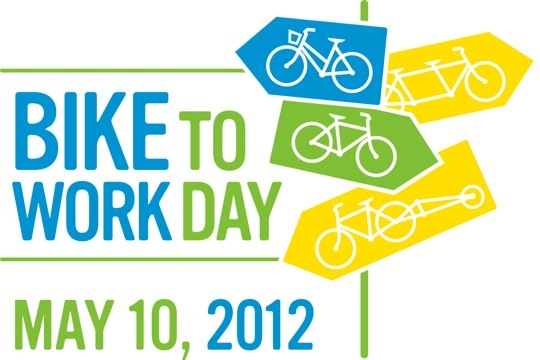 Lots of stuff going on in the coming weeks, with art, biking, walking, Earth Day and more. they'll be raising money for Richmond Spokes and having fun with a theme of Under the Sea. Sorry about the delay in posting upcoming events. We were without power much of the day yesterday. Tomorrow is a First Friday, so it's time again for the Art Murmur! The Art Murmur is expanding to include galleries in Jack London Square. 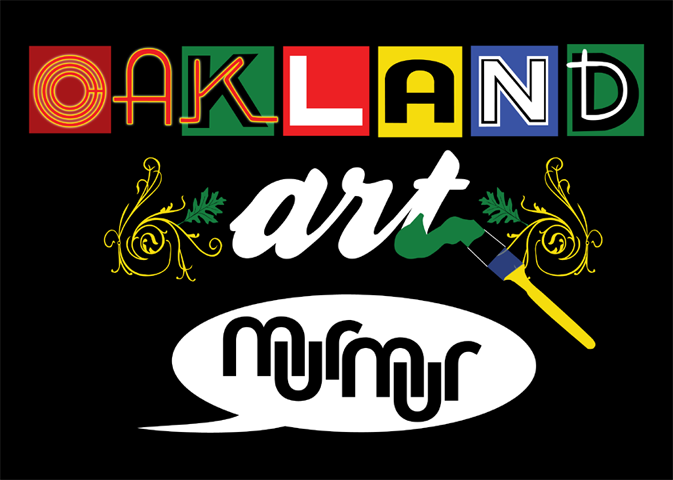 There are now Art Murmur events around Oakland. 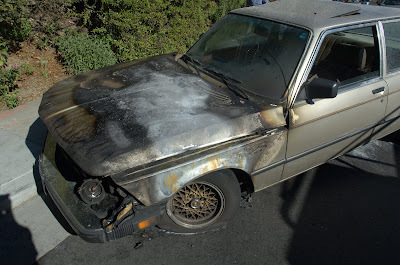 As always, let me know in the comments of other interesting events in Oakland. Easter Egg hunts and more - Friday, Saturday and Sunday. A variety of Easter Egg hunts and other activities around the city. Read more at Oakland Local. East Bay Bike Party: Under the Sea - Friday, April 13. The monthly East Bay Bike Party won't be in Oakland this time, but they'll be raising money for Richmond Spokes and having fun with a theme of Under the Sea. I enjoy art. I even like a lot of it. But it's rare that I see a work and get really excited about it, yet that's what my response to Projet En Vue was. Projet En Vue is like Faces of Oakland times 1,000. When I take pictures of people at events around Oakland, I know they each have a story. Sometimes I know a little of their story, sometimes they're complete strangers. But I rarely get a chance to hear more of their story from them. 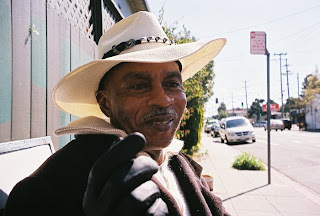 With Projet En Vue, Saskia Levy-Sheon and Sati Leonne Faulks are creating a visual and oral history of Oakland by photographing and interviewing people they meet around Oakland. Sati is the photographer and does an amazing job of capturing people. Saskia interviews them, and lets the story go where it will. Saskia and Sati choose people at random, and will interview anyone they meet or pass on the street who looks like they have a story to tell. Given the variety of people they encounter in Oakland, it makes for diverse, unusual, fascinating whole. We mostly decided to start the project because we both are passionate about people and traveling and creating portraits, Sati through photography and me through words. We were also incredibly inspired by Oakland and wanted to learn more about our community and the people in it...The goal of our project is to put people and their stories into perspective and "in view", hence the name "en vue". They've done 17 portraits so far, but I've only read a few of them completely. Like reading a great book, I'm torn between a desire to read it straight through, but I want to savor it and don't want to reach the end. Fortunately, they're still interviewing and photographing people, so by the time I finish the 17, there'll be more to enjoy. Sati and Saskia are planning a series of gallery shows featuring portraits as well as interactive audio installations. They're also self-publishing a photo book and 'zine at a local print shop. Like everyone they interview, Saskia and Sati have their own unique, interesting stories. I plan to turn the tables on them, and photograph and interview them to learn more. Look for more info in the coming months. Check out the amazing Projet En Vue at their website.